Salt Water New England: Poll: Which city is preppier: Boston or Cambridge? 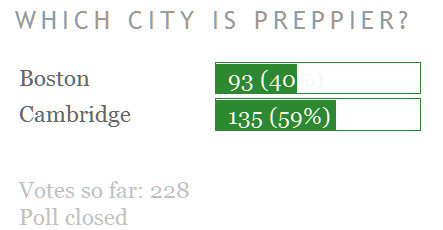 Poll: Which city is preppier: Boston or Cambridge? Here's a good Moot Court topic: Which city is preppier - Boston or Cambridge? Here are some images from (and exhibits for) each. . Please vote for your favorite in the poll. There is the always lovely Public Garden. ...took us past the Massachusetts State House on the way to King’s Chapel Burying Ground. Governor John Winthrop, ninth Great Grandfather. Boston has Brooks Brothers and other Newbury Street stores. Cambridge, of course, has Harvard. My vote is for Cambridge, but I'm quite biased to my current neighborhood. It's not even close...the Back Bay in Boston. I went to school and lived there and it's by far the preppy center of the city. Cambridge is preppy around Harvard Square...but for the most part not so much. Oh my, when you grow up the daughter of a genealogist mother lineage is never off-limits. She is also the registrar for her DAR Chapter in Missouri, so not only did I hear about our lineage, but I also knew about almost everyone elses - ha! And yes, while I agree with LPC life is about what you're doing now, now about who your family was, there is definitely a sense of pride of knowing who you are and where you came from and that your ancestors played such a huge part in the forming of this nation. However, I think feeling the way I do is also a 'regional' thing. Not that you're not proud of who you are or where you came from, but southerners -especially those of us who are DAR members and Colonial Dame members, tend to wear it on our shoulders a bit more. My vote is for Cambridge. I guess the questions itself poses a further question. What makes a town preppier? Inhabitants, schools, stores, number of libraries, old money, gentiles? On a separate (albeit not totally separate) I am a Brahmin (a "real" one) living in Boston but not a Boston Brahmin. Is one preppier than other? Cambridge, UK is the preppiest. After all, John Harvard studied at Emma. Muffy -- we seem to have much in common -- the progenitor of my family in the US, Dr Comfort Starr (1589-1659), is interred in Kings Chapel Burial Ground. I go to school in Cambridge and I have friends who live in West Cambridge/Harvard Square and the Back Bay, so I spend a lot of time there. I'd have to say that Cambridge is probably preppier. I can't say why, exactly, but it's just a feeling. Here's something to offend almost everyone. Boston and Philadelphia played such a significant role in the American Revolution that they have to get significant points for that, IMO. Boston is the home of the St Botolphs club. Named for a member of the clergy who set up a significant house of worship there. He was so significant that the community was called Bo's town, for St Botolph, ergo, Bostown. More points for Boston. Harvard is still a premier educational institution, however, as far from preppie as you can get. Look at "Social Network"; genius students, great university, but solid grunge. Our annual journey to the Princeton, Harvard game features a crowd that really resembles the fans at a Red Sox game. Not bad, just the way things are. Not preppy, IMO. IMO to get to a preppy college or university, you have to get out of the Ivies, and go to places like Hampton Sydney, or UVA. Told you this would cause a problem. As close to preppy as you can get on the Ivy campus where we live is cargo shorts, flip flops, and T shirts. Looks like the cast out of social Network. Not a thing wrong with it, but preppy? Dunno. I live(d) in Boston and wish I was back in California!!! This is SUCH a New England post! LOL! I'm in Boston 2 weeks of every month. Cambridge is hefty lefty and has no private clubs worth anything. Boston has THE neighborhoods and its not even a comparison. The most preppy city would be which ever one you are in. Muffy: Anon here (aka Sam when I am able to sign in as such). You're reading of the definitions are entirely correct. And as for playing it well, I feel totally outplayed by you since your research led to showing that the Rev. and Winthrop were also at Cambridge! In my humble opinion, Boston; the only thing Cambridge has going for it is Harvard and even that is not what it used to be. Boston! Beacon Hill, 'nuff said (for my money's worth). Beautiful, historic, classic, mind-numbingly expensive. This is despite being raised to believe Bostonians are, per my born-and-raised Nutmegger mother, "feral." Cambridge does not earn points in my book for Harvard -- other than for pure nostalgia. Like most (all?) of the Ivies, authentic preppy is almost entirely absent on campus. The immediate Harvard area still gestures to prep, but it's increasingly anachronistic. As to ancestry, I'm happy to see it mentioned. It's not PC, but a reality of living in New England (and I'm sure elsewhere) is that lineage is still powerful social currency. Some might say that this is most often true for those who do not choose to stand on their own two feet. I won't go so far. As you show, learning your own history can, beyond mere snob value, be fun. I've been to both and would have to say that Boston wins. I agree with LPC. Ancestry is tricky. I'm descended from the Randolphs of Virginia, but don't make an issue of it. I don't want to be defined by who they were, but who I am. I think society and our ways of thinking have evolved a lot since the early 1700's. We shouldn't judge them. Our ancestors were people of their times. I was invited to join the DAR, but drug my feet in getting my stuff together. I think I may eventually try again. I've lived in both cities and as a current Beacon Hill resident, I have to say Boston! I agree that ancestry is a tricky thing. I don't put much stock in it in my day-to-day life, but I'm often reminded by older generations who still find it very significant. My father once wrote me one of those "I'm disappointed in you/your grades" emails when I was in college which began with "We come from an old family in this country..." Lots of eye rolling commenced, but it did hit a chord - I think more because I didn't want my parents to be disappointed in me more so than some "family name"! On ancestry: Being aware of it usually colors ones actions for the better. In a PC world though, it is best displayed in deed (Noblesse Oblige) and manner and not spoken of unless in good company. I learned that lesson as a boy when I rode my new bicycle into a middle-class neighborhood only to be stoned. I have been reading your blog for over a year because it is “Good company”. Your linage puts mine to shame, which is actually comforting. My people were helpers to the Stuarts and escaped to New Jersey after the “Boyne”. I assume that we are entitled to SAR/DAR affiliation because we received a land grant in Ohio for our service. As for Aristocracy v. Meritocracy, I have found that they tend to go hand in hand. Prince Charles is obviously the exception... People of talent tend to develop manners and generosity over the generations. Aristocrats tend to surround themselves with talented helpers. My former wife was a helper to Otto Von Habsburg. People have libidos. An acquaintance’s grandmother was more than a helper to the last king of Italy. I come to know him by way of his girlfriend who shared Mensa membership with me (I trust that everyone realizes that most anyone that is preppy enough to have a degree from an Ivy League school dwells on the far right edge of the “Bell Curve”). To NWA I would suggest that you might have “Ancestry” after all. Consider Mohamed Ali aka Cassias Clay. It has been suggested that his verbal skills were the result of his coming from the same Clay County that the great orator Henry Clay came from. I shall recuse myself from voting because I have not had the pleasure of visiting the cities in question. Here on the Left Coast, preppy has a wider definition. E. g. our Levi’s with a camel hair sport coat etc. Have you ever looked at the Faconnable website? Its Provence Preppy is very California. My memories of living in Boston are of indie music, baseball, the Celtics, and the Rathskeller in Kenmore Square - not a pink polo in sight! (But THANK YOU! for the photos - what a wonderful place to have lived) Cambridge, though, was where I noticed the prep along the Charles while running an inter-city loop around the Emerald Necklace. Then again, I am descended from a Danish merchant sailor and an Alabama southern belle, so my NE preppy credentials extend only as far back as my growing up by accident in MA and attending an Ivy... If a dilettante may vote, I'd say Cambridge. Cambridge. That's clinched by the sheer number of Harvard students sent by the major independent schools (I never actually heard any of my classmates call them "prep schools" and I went to a well known boarding school for four years). It should be noted that "Dudley House" is not a house in the sense of the other Harvard Houses (dorms). It's more of a large building with facilities for all the Harvard students who chose to live off campus because they didn't like the Harvard residential system. I enjoyed the photos. Your in-laws have nice digs. As a person of color, I wish I could trace my lineage. @Wharf Rat -- what happened to the controversy? I'd like to disagree with you but I can't. I do not spend much time south of the Mason Dixon line anymore but I am told that many of the old southern schools are keeping the flame alive much more so than in the northeast. I have to err on the side of comfort, again. To me, the most comfortable sweaters are the handknit ones my grandmother handed down to me. Classic in nature and color, after decades of loving care, they are soft, familial and treasured. I have been to some small Midwest towns that have such a feeling of age, history and affability, that one has the feeling of pulling on an old, treasured sweater. It's a home-y feeling. I'll be moving to a small town in North Carolina for school this fall and I am excited that it has this "feel" to it already. I'm sure my Mum will be preparing my room "just so". I have dabbled in my personal genealogy for years, not in an effort to tell others about who I am but rather to tell myself who I am. I find it incredibly fulfilling and humbling to discover the lives of my ancestors -- the ones NOT in books more so than the ones in the books. To be able to visit the sites that your ancestors were a part of is overwhelming, in my opinion, and you are very lucky that the sites still exist. In regards to the question -- I really have no idea as I am not from the area. LPC -- I agree that it is what we do now that is important. However, I feel that a lot of what we do now is a result of what our ancestors did. Kathie -- I feel that everybody is interested in their genealogy but I agree that the degree to which we express it is a regional thing. Being a southerner and a DAR member, I find the pride in our lineage to be shown quite openly in the South. Muffy, I enjoyed your post and the pictures. As for many of the comments--ugh. I love hearing about ancestry, either my own or anyone else's. Maybe that's because I love history, and ancestry puts a face to it, and a link to us today. You have mentioned your husband's ancestry a handful of times, and it has never struck me as out of place, but rather it gave context to a topic or picture. I really can't stand that sort of awkward self-conscious air some have when speaking of their ancestry. Heritage is a simple fact, only one small piece of the whole person. The audience might be fascinated, amused, or disinterested, but I guarantee they won't really CARE. Goodness, I found your post and the accompanying comments quite fascinating. I've never been to either place, so I've no preference in regard to the poll or, as they say around these parts, no dog in that hunt. As for ancestry, I'm third generation Irish American (both sides) and one family heirloom now hanging framed in my sister's home is my great grandfather's naturalization certificate. The real treasure he unwittingly bequeathed me was the extraordinary Midwestern community in which I grew up and tried desperately to escape in my youth. Eventually I realized that being known for who your parents and grandparents are and for which parish and school you hail from can be much more blessing than curse, simply a conduit for connections and not by any stretch one's whole identity as I'd feared. Honestly, the older I get, the sweeter it seems. Here is my view: For historical reasons alone Boston is preppier. Boston's role in the independence of America is significant, it played such huge role in what is fundamentally "American" today, not just for Americans but for the whole world. Democracy, independence, liberty and equality became important during a time that they weren't, and Boston played key role to it. That's how a European views it! As for ancestry, it is eye opening to research where you came from. My family goes back to the 7th century, which is a very long time ago. It is impressive but not important. What is important is what we do right here right now, our impact to the world in present time. My college was founded in 1347 and the current chapel was designed and built by Christopher Wren. William Pitt, Thomas Gray and Peter Cook are alumni. Apparently every living English person is descended from Edward III, though this seems a scarcely credible 'factoid'; if you are descended from Edward I that confers at least two further generations of distinction. My own ancestors came over from Normandy in the last decade of the eleventh century. My husband's eleventy millionth great grandwhatever is at King's Chapel. It ain't easy to find. Regina Pizza is the worst! Blech. I hope Pinocchios is better - assume it's in Cambridge? While Boston and Cambridge offer small pockets of Preppydom, both are populated by people who can only be defined as everything other than prep or Trad. I agree with Wharf Rat's perspective that HSC, UVA, Wake Forest and Vanderbilt are far more "preppy" than their Ivy counterparts. But then again, The South has traditionally lagged the both the traditions and trends of the Northeast by fifty years! I offer nearby Belmont, MA as the enclave that presents the best preppy heritage circa 2011. Boston has its Egyptian ancestors on display at the MFA...thanks to Mellon, Elgin et al. Very interesting post Muffy, love it all! Thank you for your blog and honesty. I grew up in California but was born in Boston -on Commonwealth Avenue and thought, 'so that's what it looks like,' when I saw your post photo. Thank you again. Hope you don't get too much heat from viewers out in blogland. If I had a blog don't know if I could be as honest and expose myself as much as you have. An awful lot of hate behind the 'anonymous' designation. Sometimes one would be better off not knowing one's lineage, as I found out recently. But I'll say this: I am much prouder of my grandfather, first-generation Irish-American, World War II hero, and lifelong union man, than I ever could be of the ancestors who, I've been told, make me eligible for the DAR. Cambridge has a deeper patina...not indexed just to years and chronology but ... but ... I can't explain. I don't know why but this blog entry really had me thinking about what someone wrote in the comment section about...the whole point of America is that you are what you are doing now. Not who your family was. That is true but ancestors like yours are the ones who made it possible for we Americans to be who we are and achieve what we can. So, as we are proud of our meritocracy, so should we be proud of those who made 'meritocracy' possible. You are far too nice. My rather arrogant blast about Pembroke College deserved a much tougher response. We're quite bright, but you have far better clothes. Thanks for the stroll through Boston - one of my favorite cities! I belong to 12 lineage societies and would like to make a very important point: most active lineage societies (like DAR and Colonial Dames-and there are actually three "colonial dames" groups) are really service organizations which have a lineage requirement. Members work for and donate to causes like historic preservation, increasing literacy, lineage research and helping the veterans, to name a few. For persons of color: DAR has members who are of Native American, black and Asian descent as well. DAR has recently published a book about "the forgotten patriots", available from the national website. There is more genealogical information available than one might think! Lineage societies are non-political groups, but members are, in my experience, generally very interested in history and well educated. History must be studied as objectively as possible and in context as well. Pulitzer prize and National Book Award winner author David McCullough, who has written some very scholarly books about people in early American histoy, is an author I recommend very highly, if one is interested in learning more about early American history. LPC - I don't understand your comment or its point. You call yourself a High WASP and have mentioned several times on your blog that your ancestors signed the Declaration of Independence. To some of us, ancestry isn't tricky. It is interesting; and, it DOES matter to me who my family was (perhaps because none of us knew for at least the past 100 years). LPC - I am having trouble understanding your initial comment "...the whole point of America is that you are what you are doing now. Not who your family was." Is this meant as a rebuke of Muffy's inclusion of the topic of genealogy as being un-American? And aren't the terms "High WASP" (btw: please define) and "Life of Privilege" exclusionary and not based on merit by design? I am quite confused. Oh, just to add, for a bit of amusing information - the least preppy MIT students can certainly turn preppy, though. The stereotype of the mad genius whose mind is always working overtime, and who is too busy inventing to care much about appearance is actually based in reality. But BOTH of my sister's college boyfriends later got their doctoral degrees at Oxford, and based on recent pictures, they have both adopted upper-class British style, with success. boston, hands down -- esp. backbay and beacon hill. to me cambridge always seemed a bit dumpy. Boston, absolutely. By definition, Cambridge has been bombarded with countless cultural challenges from outside via Harvard and MIT. That is Smug LINCOLNSHIRE Git. So much for premature smugness, eh? PS Boston and Cambridge in the USA are also very Good Things, both of which I am lucky enough to have visted and worked in very many times. Indeed, I fell in love with a beautiful Tennessee lass in the back of a cab one beautiful snowy Thanksgiving night - told the driver to just keep going up Commonwealth Ave and back again. Happy days, beautiful city (ok cities). Cambridge certainly WAS very preppy until the 20th and 21st c. replacement of the Brahmin organic ruling class (same families as Boston) with a fairly hostile foreign-born inorganic 'ruling class'. The place still has the look (apart from the students and faculty), but the preppy soul of the place is no more than a ghost. 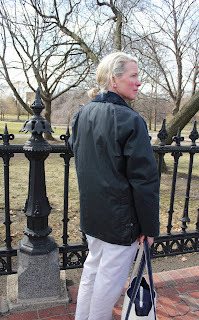 Boston has stronger preppy pockets on Beacon Hill, the Back Bay and other places where Boston Brahmins still carry on. We were driven from the State House (and national government) in the 19th c. but retreated successfully into finance, the arts, historic preservation etc. The New England gentry who were arguably among the most successful, dynamic and admired ruling classes in the world now play and toil on in relative anonymity since the new money made an alliance with the proletariate to wrest political control of the nation from our hands.